The Ski Club of Great Britain recently sold its offices in Wimbledon and rented more modest accommodation in the area. This left it with a problem: what to do with its extensive archive of British skiing heritage built up over the past 115 years since the Club was established by a group of friends during a meeting at the Café Royal in London on 6 May 1903? As part of the process of modernising the Giffre skiing area, Samoëns in the Grand Massif has added a new six-seater high speed detachable chairlift this season. The new Doppelmayr built Coulouvrier chairlift with a capacity of 3,000 people per hour has replaced two old three-seater Poma fixed chairlifts (Lanche + Gouilles Rouges). Costing £15 a year to join the benefits of fan membership include, "Behind-the-scenes news, discounts and the opportunity to win great prizes," whilst helping support the UK's elite snowsports athletes financially. United Airlines will become the third airline to fly from London to Denver direct from March, only a few years after options on the route were severely limited. BA and American airlines share one service on the route and Norwegian more recently launched a direct service with three weekly flights from Gatwick, using the no frills airline pricing model. It's the turn of the Pyrenees to get the best new snow this week - up to 35cm reported so far overnight and the snow has continued to fall in most areas in the region through today. The biggest snowfalls so far have been reported on the French side where most areas have had 20-30cm of fresh snow in the past 24 hours, with Ax 3 Domaines claiming 35cm (14 inches). 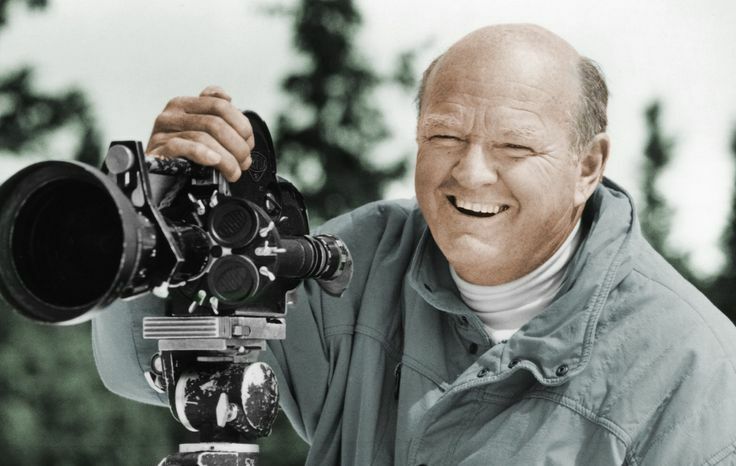 Sad to hear of the passing of Warren Miller today, aged 93. After some more massive snows, the weather has cleared for a few days allowing Alpine resorts to open more terrain. There are improving weather conditions in the Alps as blue skies re-appear and ski resorts are able to make ski runs safe to open and in some cases routes in and out of their villages. Zermatt is the most high profile of the villages that were cut off either by snow or avalanche danger (others, at various times, included Andermatt, Cervinia, Davos, St Anton and Wengen). A volcanic eruption described as "small" and "unexpected" by Japanese authorities has hit a ski resort north-west of Tokyo this morning. 2,160-metre (7,090 ft) high Mt Kusatsu-Shirane was not one of those actively monitored by Japan but the eruption is reported to have set off an avalanche and a cloud of volcanic ash and sent boulders rolling down the slopes. 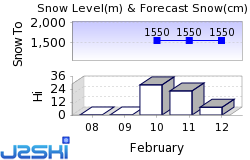 J2Ski is receiving ever more sensational snowfall stats from the Alps, although in many cases these big numbers are causing big problems for ski areas that are unable to open their ski slopes (or only a small part of their terrain) due to the resulting avalanche danger, or are again cut off from the outside world. So far the Hahnenkamm slalom race appears to be on despite heavy snow on the course at Kiutzbuhel. Britain's Dave Ryding will be attempting to go one better than a year ago when he placed second in the race behind World champion Marcel Hirscher. Big traffic jams are reported to have built up today on the roads to Scotland's ski centres as skiers and boarders attempted to rake advantage of superb conditions. Scottish centres have seen almost a month of consistently sub zero temperatures and the stormy weather that often plagues resort operations appears to have impacted to the south instead so far this winter. Access to Zermatt (pictured above a week ago) will be closed again this evening due to avalanche risk. The shut down will begin at 10pm this evening and it's not known when it will end, however the resort says it will provide updated information tomorrow morning. In the meantime they're suggesting anyone planning to get there seeks accommodation in a Swiss city instead. will again be difficult for drivers trying to get to and from ski re4sorts, particularly in the Western Alps. The latest stormy weather arrived midweek but has not really let-up, with forecasters now predicting more big snowfalls accompanied by fairly strong winds on Saturday and Sunday at many areas. The event, masterminded by the International Ski Federation gets better each year and in 2018, its seventh staging, 521 events and activities are planned in 46 countries around the world. Initiatives tend to include special fun World Snow Day events, and free or heavily discounted activities, lessons and tester sessions. Conditions on Scottish ski slopes are expected to be amongst the best they've been for several years this week at several of the country's ski centres following significant snowfalls over the past 72 hours. The five Highland ski centres have enjoyed consistent low temperatures over the past few weeks and had limited terrain open but will now be able to open most or almost more of their slopes. 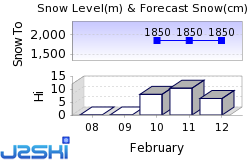 Snowfall is starting to fall again after a 4-5 day period of largely dry, sunny weather in the Alps. Forecasting models are currently pointing towards 50-70cm of snow for many ski areas by the weekend, but some are expecting 25cm, or more every day for the coming four days to give more than a metre more snow in total. The world's largest ski resort operator, The Compagnie des Alpes, has signed a ?38m deal with lift company POMA to supply five new gondola and chairlifts to Val d'Isère, Tignes, Méribel, La Plagne, and Serre Chevalier ski areas in time for next winter. Installation for all five ? which will include some models that are the first of their kind in France - will start this summer with opening planned for December 2018. Yep, here we go again... another major snow storm is about to bring big snows to a significant part of the European Alps over the next few days. Expected to bring heaviest snow to the northern/western Alps (northern French Alps, Swiss Alps) it is a big one, and just about the entire Alpine region should see at least some snow. A new grouping of a dozen Canadian and US resorts that was created from scratch in around a week last spring, surprising the North American ski world, has finally decided on a name: The Alterra Mountain Company. The conglomerate came about when two businesses, Colorado-based finance house KSL Capital Partners (the main investor) and Henry Crown and Company (a smaller investor) which already owns Aspen Ski Company, went on a (guesstimated) $2 billion spending spree and snapped up resorts including Steamboat and Winter Park in Colorado; Mammoth, Alpine Meadows and Squaw Valley in California; Deer Valley at Park City in Utah and Eastern Canada's most popular resort, Tremblant in Quebec, along with half-a-dozen others. Val d'Isère (pictured above during a break in the snowfall last Friday) is reporting another 60cm (two feet) of snow in the past 24 hours as a second wave of heavy snowfall passes the area following storm Eleanor's dramatic visit last week. A new cable car as begun operating to access the highest mountain and highest ski slopes in Germany on the Zugspitze near Garmisch Partenkirchen. The new lift has taken six years in planning and construction and the lift company has noted that lift engineer often had to work in extreme weather conditions 3,000 metres above sea level. It has been a windy and snowy day in the Alps but many ski areas that closed completely yesterday have opened a little more terrain today and those that felt so threatened they asked their visiting skiers and boarders to remain in their accommodation if possible, including Tignes and Val Thorens, lifted their curfews this morning. Several ski resorts in the Alps have announced they've closed their entire ski areas for the day due to the severe weather that is hitting much of central Europe. Resorts in the Western Alps seem to have been the most severely impacted so far with Alpe d'Huez, Avoriaz and most sectors in the Chamonix Valley announcing they're closed today, whilst many other big areas have only a few lifts close to the resort base operating. Val Thorens has issued a severe storm warning for a 60 hour period to 4th January, commencing at 9pm tonight. Big Snow Forecast this week - 3rd and 4th January 2018 - READ THIS! If you're in the affected mountains, or travelling to, from or around them in the next few days... please take note and plan accordingly! Stay Safe! The forecast for Wednesday through Friday this week, particularly for the North and West of the Alps (French and Swiss Alps in particular), has huge amounts of precipitation, lots of wind and rapidly varying temperatures. Read the full Article : Big Snow Forecast this week - 3rd and 4th January 2018 - READ THIS! As the Alps currently receives its third significant snowfall in a week, forecasters are predicting the snow will keep falling over the week ahead with some areas potentially receiving a metre more snow over the next 72 hours by Friday. St Anton has 102cm forecast, Les Arcs 105cm, Val d'Isere 126cm and Chamoix 127cm moresnow expected to fall before the weekend.